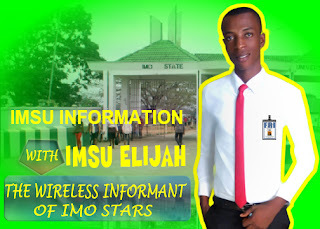 I Elijah Madubuihe known also as Imsu Elijah of Imo State University want to use this medium to say a big 'Thank you' to all Imo state students, friends, supporters and intellectually precocious honchos who stood gallantly beside me and gave me a priceless support in the course of creating a paradise to live for Imo Students during the National Union of Imo State Students (NUISS) Convention held at Freedom Square on Friday Nov. 30. I salute your doggedness for not being influenced with stipends during the electioneering in the convention. You are the real hero that Nigeria needs for rebirthing of a better society mindless of colours, religion, ethnic etc. The list is so endless, from my Institution to other campuses, from offline campaign to social media, the support I felt was so massive and I owe it to you all. I must confess, your names are not written but casted in the immortal pages of the book of my heart. Finally, I once again commend your richness not because you are monetarily rich as erroneously believed but owing largely to the richness in your kind heart. Please accept the assurance of my highest regard. Thanks and God bless.